Last night I had the pleasure of meeting Mr. Domi on a snowy Halifax Street just before the Prospects Game was to be played at the Halifax Metro Centre. Being 55 and a bit out of the hockey loop, (Bobby Orr was my guy back in the day and I have his hockey cards collected by my tom boyish 13 year old self to prove it), I had been given a ticket to the game and while husband couldn’t make it, I decided to stare down the weather and go ( we had a bit of a snow storm here in Halifax last night). I’m very glad I did because I met your charming client, who was every bit as youthful and pleasant a hockey ambassador as when, my then 9 year old son Alexander and I, first met him while waiting outside the side doors (?…I’m not that familiar with Toronto as this was our one and only trip to see the Leafs play at the old Maple Leaf Gardens ( 8th of March 1997). It was a big deal for our family. Being a small town girl, I had nervously purchased my tickets for that night’s game from a scalper whose name was Monty, in a side alley up from the Gardens (must say good value for the price of the tickets, thanks Monty) actually leaving my young son with 2 chaps I had just met, who were watching the Leafs practice. Anyway, to cut to the chase, many players came out that afternoon, but it was only your guy who offered to pose for pictures with Alexander ( I was too backward to ask) and even when my disposable camera sputtered, he patiently stood for more pics. Everyone else waiting for the players was closer to my vintage, asking the players to sign memorabilia and the like. Alexander was the only child, complete with a Winnie the Poo autograph book (my son will kill me for this) and wearing his TASA Mighty Ducks hockey jacket and Mr. Domi came right over to him. Lovely. For a second back then, I even thought for a moment, ROBERT GORDON who????? 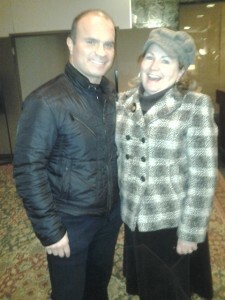 So when I met Tie on the street last night and with Alexander, now 24, having recently mentioned he would love to have a Maple Leaf jersey with Tie’s name and number on it, after my clever conversation starter, “You’re Tie Domi”, I had to engage your chap in a chat to ask how I would go about this. He didn’t disappoint and was every bit as pleasant as all those years ago and I was so out of the hockey loop that I didn’t even realize his son Max was one of the gifted athletes playing that night. Now, in the interests of full disclosure, a few years back, I did buy a Davey Keon jersey ( I know) but my brother Scott loved him and we got it for his 50th BD ( size xxxl on EBAY) and Scott is trim like Tie but that didn’t matter. I was planning to do the same thing for Alexander or phone the Maple Leafs team office to buy one from them but when I asked Tie how to go about it, he said to go to TieDomi.com. I have obviously done that but could not locate his jersey for sale on your site and so I am writing you for your advice on how I would go about purchasing same. Alexander is 6 foot 1 and very slim and so I was planning on buying a large. I know this is likely not within your usual duties but if you could direct me in this effort to buy a Tie Domi authentic jersey I would be grateful. I apologize for how scattered this all sounds but I am still a little star struck from last night and how happenstance the meeting was. I doubt I would be have been more thrilled if Robert Gordon himself had shown up to coach his team. Tie also asked me to remind him of our meeting so he could put my chubby face to the request. The picture turned out great and will be circulated to all the relatives for sure and placed alongside those shots of him and Alexander taken 16 years ago. PS I didn’t realize that Tie’s son Max was playing last night and he still took time to speak to me ( not that I gave him much option) and what a talented hockey player who had a super game last night; exceeding, in my humble opinion, the play of some other young chaps who are highly rated across the county. Go Max!! Oscar-nominated actor Mark Wahlberg caught up with his buddy Tie Domi in Toronto on Tuesday and tempted the retired NHL enforcer with a friendly bout in the boxing ring. 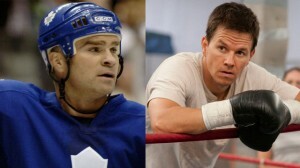 “Hey, Tie Domi, I’m officially challenging you,” Wahlberg, who co-produced and starred in the 2010 Oscar-nominated boxing flick The Fighter, told Domi when the tough-guy hockey player called him on his cellphone during an interview. Belle River’s Tie Domi, left, is checked during a game against the Red Wings at Joe Louis Arena. The Toronto Maple Leafs added three of the toughest NHLers of all-time to their roster for the Alumni Showdown ahead of the 2013 NHL Winter Classic. 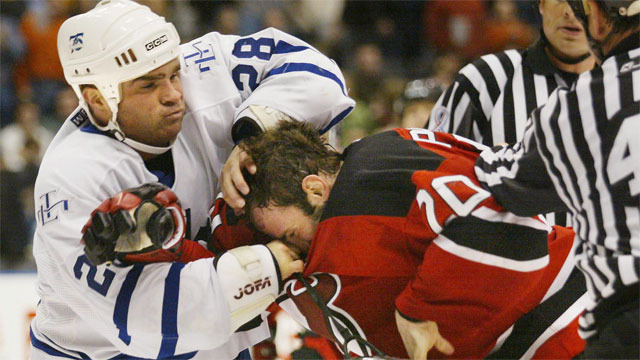 Enforcers Tie Domi, Dave ‘Tiger’ Williams and Brad May will all be in the lineup when the Leafs take on the Detroit Red Wings Dec. 31 at Comerica Park. Check out this amazing tribute video by my talented super fan, Sebek Zelina. Thanks for the awesome trip down memory lane, Sebek! Ex-Toronto Maple Leafs Mats Sundin and Tie Domi will be reunited in the Winter Classic alumni game at Comerica Park. 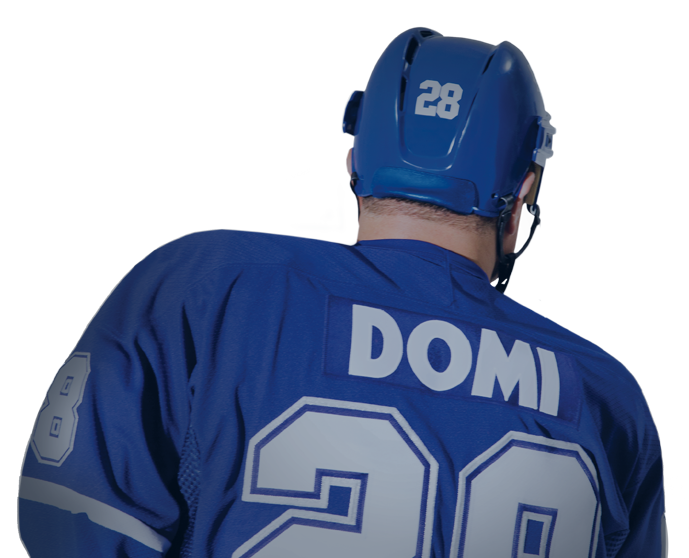 Domi told TSN Radio 1050 Thursday that he and Sundin have been asked to take part in the alumni game — the Leafs will take on the Detroit Red Wings –that will be held as part of the Winter Classic celebrations. The retired Leafs tough-guy said the two former teammates would likely play. Former NHLers Bob Boughner and Tie Domi and former Major League Baseball player Stubby Clapp will be among the eight new inductees in this year’s class of the Windsor/Essex County Sports Hall of Fame. The group announced Wednesday includes three in the founders category and five in the athletes category, who will be inducted in the 32nd class at the Caboto Club Oct. 13.